This documentary about a small Texas town helps us remember that, wherever we are, we're all part of the same human struggle. Cruisin’ through the mangrove forest. Uncertain — a documentary about a remote Texas town of the same name — is not a political film. However, while watching it I couldn’t help but recall an economics anecdote I recently heard in relation to the rise of Trumpism and other populist movements of late. While inequality between countries is decreasing, inequality within countries is increasing. I would argue this paradigm applies to culture and social norms as well. Globalization means that a software engineer in San Francisco will have a lifestyle more similar to a banker 6,000 miles away in Shanghai (griping about soaring rents or rideshare surge pricing) than a farmer just 60 miles away in California’s Central Valley. A sign on the way to the town of Uncertain. 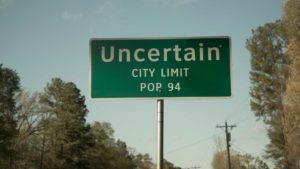 Though Uncertain is an American film set in an American town, in some ways its story felt as foreign as those of the many non-US movies we review on Cinema Escapist. Population 94, the town of Uncertain lies along the Texas-Louisiana border amidst swaths of swampy mangrove forest. It’s marginal in multiple senses of the word. “Uncertain is not on the way to anywhere, you either got to know where you’re going or be lost to find it,” says the town’s sheriff. Lying at an inaccessible confluence of borders also means that Uncertain attracts people from the edges of society, particularly those with criminal histories. 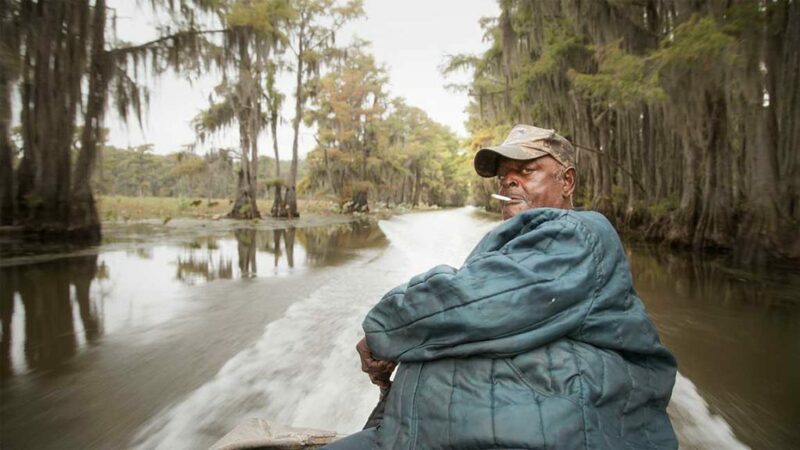 As the film drifts through shots of beautifully foreboding swampland, waters choked by an invasive plant species, an aura of mystique builds. While it might have many scenes with plants and animals, this isn’t some nature documentary. Uncertain is ultimately something that focuses on human stories — three of them, to be precise. The film features a trio of characters who seem to represent past, present, and future. There’s Henry, a 74 year-old African American fisherman and tour guide struggling with traumatic experiences from his past; Wayne, a middle aged recovering addict who finds a new passion in hog hunting; and Zach, a twenty-something diabetic looking to find a new life elsewhere. They are marginal men, looking for purpose in a world that’s forsaken them. Wayne on the hunt for wild hogs. This might tick off a few boxes associated with “typical Trump supporter”, but again — Uncertain is a human narrative, not a political one. Admittedly the film was shot before 2015; if it was made today things might be different. But there’s a beauty in Uncertain being a snapshot from the recent past, because the documentary has no reason to try and shove its characters into predefined archetypes. Henry, Wayne, and Zach don’t talk about politics or social issues, they talk about life. The film never judges, and as a result you don’t either. Even if the outer trappings of their lives may appear foreign, the men’s human motivations are not. There’s something refreshing about that. Today, it’s difficult to avoid contextualizing Uncertain within the circumstances — a revolution of marginal men, you could say — that led to Donald Trump’s election. 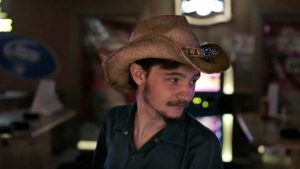 Though it was never intended to be a political movie, Uncertain has taken on a newfound political significance not because it’s a piece that analyzes “how the other half lives”, but rather a way to remember that everyone, whether you’re in a small Texas town or a big coastal city, is part of the same human struggle. Such a reminder about the importance of empathy could not have come at a better time. Want to watch or learn more about Uncertain? Check out the film’s website. Uncertain — Directed by Ewan McNicol and Anna Sandilands. Limited theatrical release in March 9, 2017 followed by VOD release on March 17, 2017. Running time 1hr 21min.